Vaccines are supposed to be safe according to the U.S. CDC/FDA, so how come the HRSA division of the U.S. Department of Health and Human Services publishedStatistics Reports  for the period ending September 3, 2013 providing data verifying that vaccines cause damage and even kill? The period covers fiscal years (FY) 1989 to FY 2013. There were 3,387 compensable claims—meaning those claims that received compensation or money, and 9,651 claims that were dismissed, an awful miscarriage of the original intent of the National Vaccine Injury Compensation Program created by Congress and Public Law 99-660, in this writer’s opinion. The U.S. Court of Federal Claims (aka the vaccine court) paid out $2,569,336,538.59 for compensable claims and $104,202,681.85 for attorneys’ fees representing those claims. The court paid another round of attorneys’ fees for dismissed claims totaling $56,375,431.34, plus $15,190,454.29 for interim attorneys’ fees. Judging by attorneys’ fees paid out, it looks like attorneys do pretty well, instead of injured claimants, i.e., those the court decides to dismiss. Here is the nitty-gritty of the reports filed: Injuries, Deaths, Compensated, and Dismissed claims. The vaccine attributed to causing the most deaths was DTP with 696 deaths. 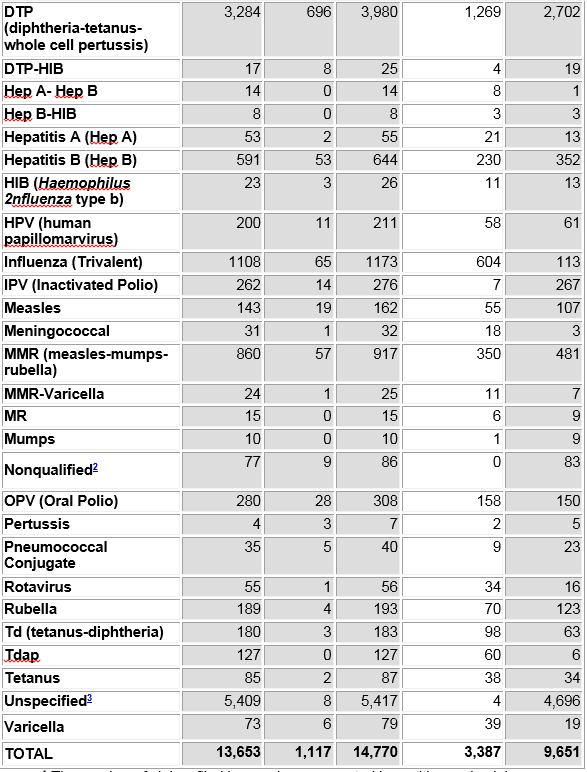 Coincidentally, of the 32 vaccines listed, very few—only 5—had no deaths attributed. The chart below is copied and pasted from the HRSA website. 1 The number of claims filed by vaccine as reported by petitioners in claims since the VICP began on October 1, 1988, and how many of those have been compensated or dismissed by the U.S. Court of Federal Claims (Court). Claims can be compensated by a settlement between parties or a decision by the Court. 2 Claims filed for vaccines which are not covered under the VICP. 3 Insufficient information to make a determination. However, in the last report at the bottom of the HRSA Statistics Reports website, data list how many doses of various vaccines were administered during calendar years 2006 to 2012. The vaccines that seem to pose the most problems are: Influenza, DTaP, MMR, Tdap, HPV, and Hepatitis B. The total doses of vaccines given during that time frame were 1,968,399,297 – almost two billion vaccines. However, those vaccine administered figures are not juxtaposed against the VAERS reporting system for adverse events, which needs to be taken into consideration for the “full force and effect” of vaccination campaigns and public relations.